Rationale, potentials and promise of systematic review. Part I: Systematic reviews of controlled trials. Assessing the quality of controlled clinical trials. Obtaining individual patient data from randomised controlled trials. Assessing the quality of reports of systematic reviews. Part II: Investigating variability within and between studies. Going beyond the grand mean. Why and how sources of heterogeneity should be investigated. Analysing the relationship between treatment benefit and underlying risk. Investigating and dealing with publication and other biases. Part III: Systematic review of observational studies. Systematic reviews of observational studies. Systematic reviews of prognostic studies. Systematic reviews of evaluations of diagnostic studies. Part IV: Statistical method and computer software. Statistical methods of examining heterogeneity and combining results from several studies. Choice of effect measure for binary outcomes. Part V: Using systematic reviews in practice. 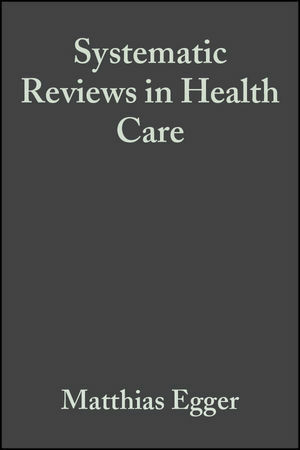 Applying the results of systematic reviews at the bedside. Numbers needed to treat derived from meta-analysis: pitfalls and cautions. Using systematic reviews in clinical guidelines development. Using systematic reviews for evidence based policy making. Using systematic reviews for economic evaluation. Using systematic reviews and registers of ongoing trials for scientific and ethical trial design. Part VI: The Cochrane Collaboration. The Cochrane Collaboration in the 20th Century. The Cochrane Collaboration in the 21st Century: ten challenges and one reason whey they must be met. To either read or download the following files as Portable Document Format (.pdf) files you will need to have Adobe Acrobat Reader, which you can download for free from the Adobe website.